One of the most important activities to continue as we age is exercise. Whether it's taking a walk, squatting, or strengthening muscles with weighted movements, any type of physical fitness is beneficial to our health. It is especially helpful for balance, which tends to decrease over time. A lack of balance can lead to falls and injuries. But a little exercise multiple times per week can go a long way in maintaining balance, strength, and mobility. Here are some of the many benefits of balance exercises and some examples to try at home. Fall prevention is a primary benefit of keeping and improving balance with age. "Good balance can improve coordination and the ability to react to sudden changes in direction," says Katie, national director of life enrichment at The Goodman Group. Working on balance can improve strength, as well. "Balance combined with strength training is ideal," she says. "Both help maintain strength in your core and your legs." Improving balance and strength also improves our overall quality of life. 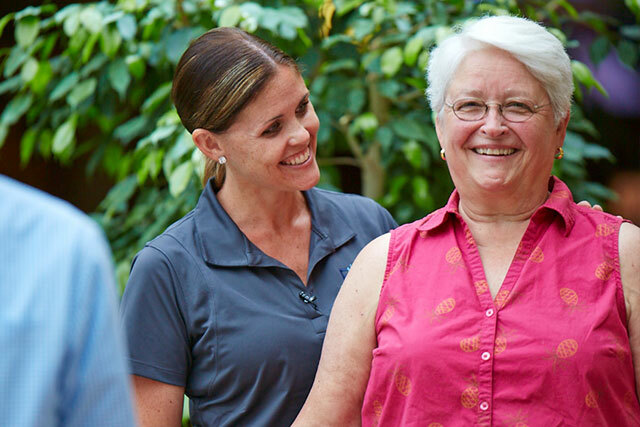 "Good balance helps us move smoothly and confidently every day," she says. 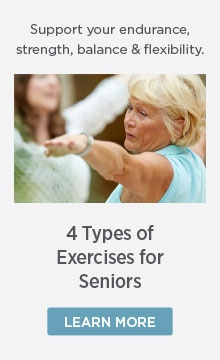 "It helps seniors stand for longer periods of time and walk with greater confidence. Hopefully, that can translate into everyday life." Katie recommends exercising at least twice per week, but the exercises she shares below can be done every day. Start easy and build up repetitions and levels as your balance and strength increase. The only item you need for this series of exercises is a chair to hold for balance if needed. Level 1 - Use both hands to hold onto the chair in front of you. Level 2 - Use the chair for balance only or do not hold onto it at all. 1) Stand in a relaxed position with your feet shoulder-width apart. Take deep breaths for 30 seconds. 2) Bring your feet together. 3) Stand with your feet shoulder-width apart. Shift your weight slowly onto your right leg, then slowly shift to the left leg. Continue shifting your weight back and forth for 30 seconds. 4) Stand with your feet shoulder-width apart. Push up onto your toes and then rock back on your heels. Continue a slow and steady pace for 30 seconds. Level 3 - If you’re comfortable not using the chair in front, cross your arms across your chest as you do the exercise. While sitting, scoot forward on your chair with your feet solidly on the floor, at right angles to your knees. Lean forward at your hips with your nose over your toes. Stand, driving up with your legs. Bend your knees and return to the chair, landing softly, using your leg muscles to control the sit. Take a deep breath, relax. Repeat 10 times at a slow and steady pace. Start standing. Alternating legs, lift your knees as high as is comfortable. Repeat 20 times, each leg. Stand with your legs shoulder-width apart. Lift your right leg out to the side as high as you can while maintaining safe balance, then return to the center. Lift your left leg out to the side, then return to the center. Repeat 12 times each leg. Holding onto the chair in front of you, take a wide step with your right leg out to the side. Step with your left leg to the right, to bring your feet together. Now, take a wide step with your left leg to the side. Step with your right leg to the left to bring your feet together. Repeat 12 times each side. Place your right foot directly in front of your left, so the right heel is right in front of the left toe. Hold for three breaths. Return your right foot next to the left. Place your left foot directly in front of your right, so the left heel is right in front of the right toe. Hold for three breaths. Return your left foot next to the right. Repeat 5 times, each side. Slowly raise your left foot off the floor. Hold for one deep breath. Lower your leg to the floor. Slowly raise your right foot off the floor. Hold for one deep breath. Lower your leg to the floor. Holding onto the back of the chair in front of you, make sure your knees are aligned right over your feet. Slowly lower yourself into a squat, pushing your buttocks back so your knees don’t go past your toes. Hold for one deep breath, then return to standing. Practicing a variety of these exercises a couple times a week will show great improvement in your loved one's overall balance, strength, mobility, and quality of life. Remind them to take it slow, resting when needed or stopping when tired.